I don’t know where you stand on reincarnation, but let me give you a tip: Given a choice, don’t come back as an elephant. Especially if you’re going to be anywhere near people. In the summer of 1816, Hackaliah Bailey took Old Bet on a tour of New England, stopping wherever he could get people to pay 25 cents to see her. As part of the show, Old Bet could uncork and drink from a beer bottle. But in Alfred, Maine, a local named Daniel Davis hid in some bushes and as Old Bet passed, shot her twice in the head, killing her. 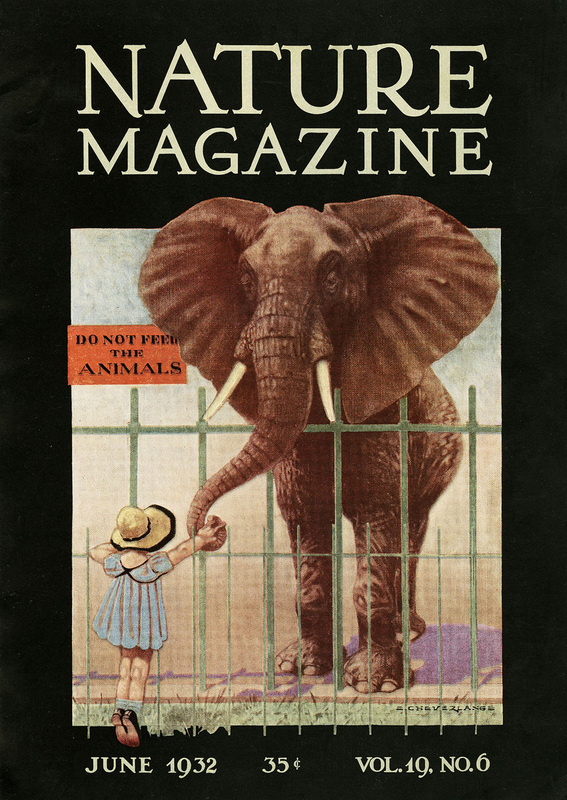 When arrested, Davis told authorities that farmers had a hard life and it was stealing from their families to charge 25 cents to see an elephant, and besides, the elephant was journeying on the Sabbath, which was sinful. Davis was released after three days in jail. You would think Bailey would have learned something, but no. He replaced Old Bet with a new Betty and as part his spiel, he proclaimed that bullets could not pierce her hide. On May 25, 1826, she was ambushed and shot dead in Chepachet, Rhode Island, by five young men who had to see if Bailey’s claim was true. 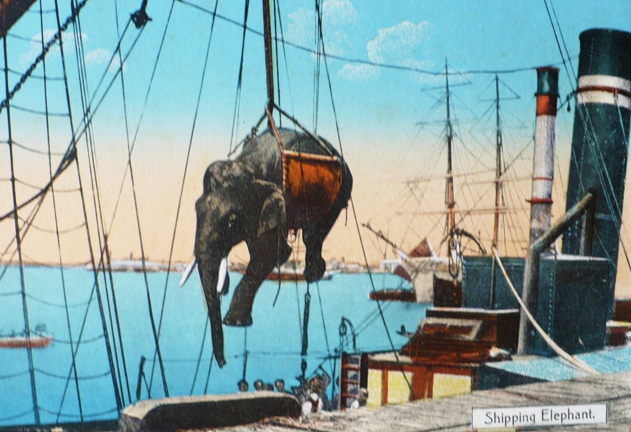 Lallah Rookh was an elephant in Dan Rice’s circus, known for her tightrope walking act. In August 1860, Rice had her swim across the Ohio River in Cincinnati to drum up publicity. It took her 45 minutes to swim the river and a month to die from the exertion. 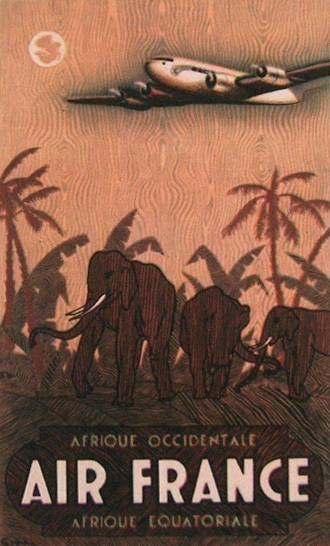 You might think things would go better for an elephant in Paris. But no. 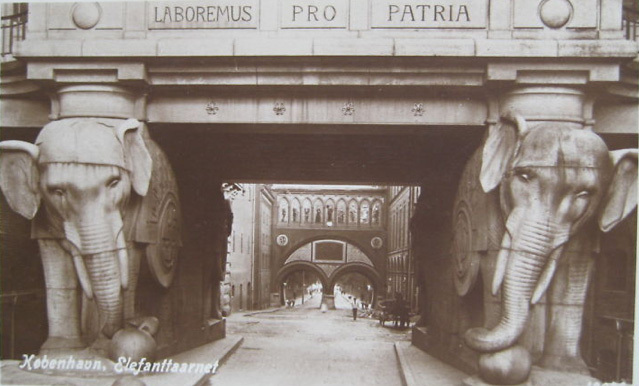 In 1870, during a siege by German troops, the zoo in Paris became a meat market. Sibling elephants Castor and Pollux, known and loved for giving rides to children, were slaughtered for their meat. Henry Labouchere wrote, “Yesterday, I had a slice of Pollux for dinner… It was tough, coarse, and oily.” What an ingrate. 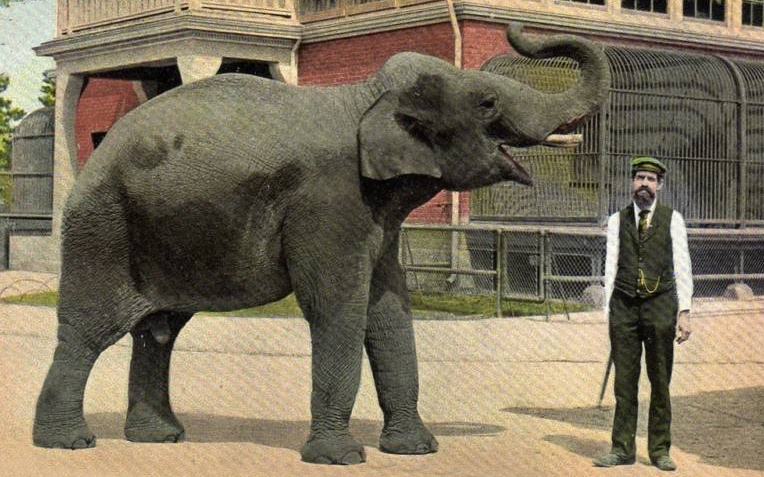 Topsy spent the last years of her life at Coney Island’s Luna Park. Because she had killed three men – one being a trainer who fed her a lit cigarette – Topsy was deemed threatening. When it became known she was to be put down, inventor Thomas Edison lobbied for the use of his competitor’s Alternating Current (AC) for the task. Edison at the time was heavily invested in Direct Current (DC) and wanted to show Westinghouse’s AC was lethal. He actually knew AC was the better alternative, but business was business, and he was a reptile. 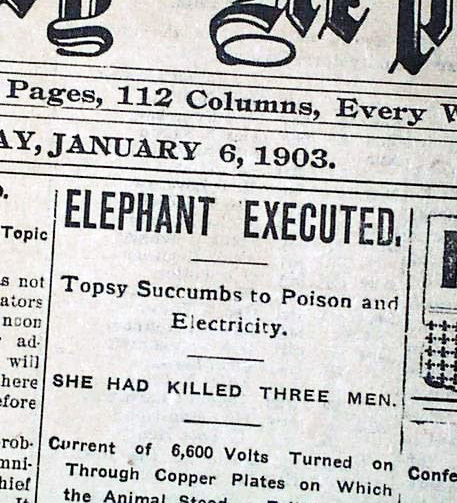 On January 4, 1903, at the age of 28, Topsy was fed carrots laced with cyanide, then 6,600-volts surged through her body. She was dead in seconds. A crowd of 1,500 watched her die; lest anyone miss the scene, Edison filmed it to be seen by audiences all over the United States. Baby Roger was purchased by the children of Providence, Rhode Island, for the Roger Williams Park Zoo in 1893. He was much loved until he grew older and became irritable; he grew suspicious of boys after one fed him fishhooks. He was sold to a circus in 1915. He was executed in Georgia after killing another elephant who was stealing his hay. Mary was an elephant who performed in the Sparks World Famous Shows. On September 11, 1916, Red Eldridge was hired as an assistant trainer. The next day during a parade, Eldridge prodded Mary behind the ear with a hook when she reached down to nibble on a watermelon rind. She snatched up Eldridge with her trunk, threw him down and stomped on his head. She calmed down, but leaders of nearby towns threatened to bar the circus. The owner decided the way to resolve the situation was to kill Mary in public. She was taken to Erwin, Tennessee, where a crowd of 2,500 people (including most of the town’s children) watched as Mary was hanged by the neck from an industrial crane. Black Diamond was owned by the Barnes Circus. 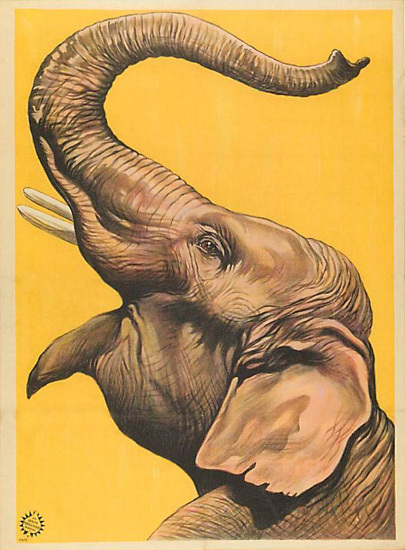 At nine tons, he was said to be the largest elephant in captivity. But he had poor impulse control, which led to his being kept chained to two calmer female elephants during parades. However, on October 12, 1929, in Corsicana, Texas, that wasn’t enough. Among the onlookers was Curley Pickett, a former trainer who had come to see his charge. It was said that Black Diamond loved Pickett and was jealous of any rivals. When he saw Pickett standing with a woman, he gave him “a malevolent look”and tossed him over a parked car. Mr. Pickett’s companion was his employer, Eva Speed Donohoo, the former Society Editor of The Houston Post. While Pickett was still airborne, Black Diamond decked Mrs. Donohue and butted a parked car onto her body. She died. A telegram was sent to circus owner John Ringling asking for his thoughts; soon after Black Diamond was marched out of town and shot an estimated 150 times by local marksmen. 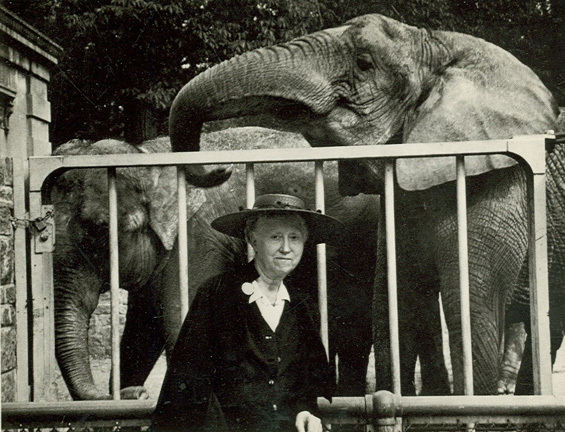 … and even a postcard with poet Marianne Moore. I am in possession of Learned Betty’s bones. Hacheliah Bailey lived in a house down hill from where I built my home in Chappaqua, N.Y. 40 years ago. He used a pond on my land to introduce water to his house, which was trail-blazing in in 1826 or thereabouts.with a 2″ lead pipe running from the old Dutch dam 450 ft down hill to his house. When we dug the trench from the street (near where his house was up to my new home 36 years ago, An elephant femur bone fell into the trench. I re-buried the bone and never dug her up, but she’s there all right. 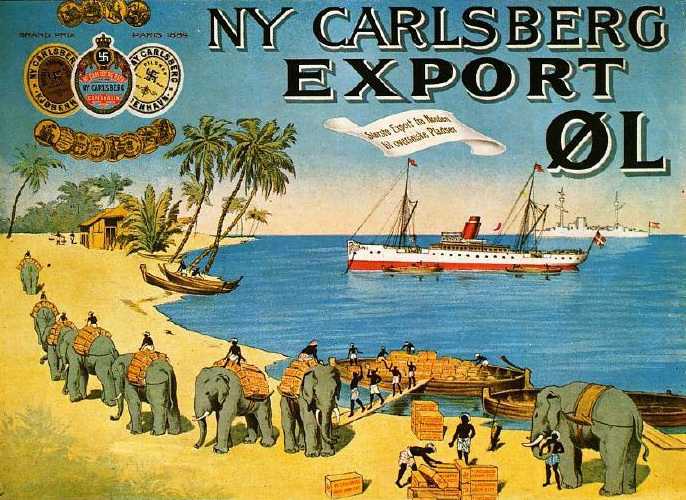 I believe that Ol’ Hach bought that particular property for the elephants, Columbus and Betty. The elephants could drink, play and wash-up in the pond and then be sheltered in an old 2 story Yankee barn which I saw, but (sorrily) never explored. It was about 200 ft from the dam on what is now a neighbor’s property. Neighbors who lived across the street in the 1970’s had a daughter with probems. She set my bulldozer and dump truck on fire and I suspect, set the barn on fire, too. Too bad because I was going to photograph it and document it, but I thing she beat me to it. It was there for 200 years and I thought I had plenty of time. I say it was Betty as Hach owned 3 elephants and we know where Ol’ Bett and Columbus’ bones are. I think Hach felt that the 120 ft long dam was a suitable headstone for Betty. And as he had workers up by the dam digging for his water line, they could also bury her bones.